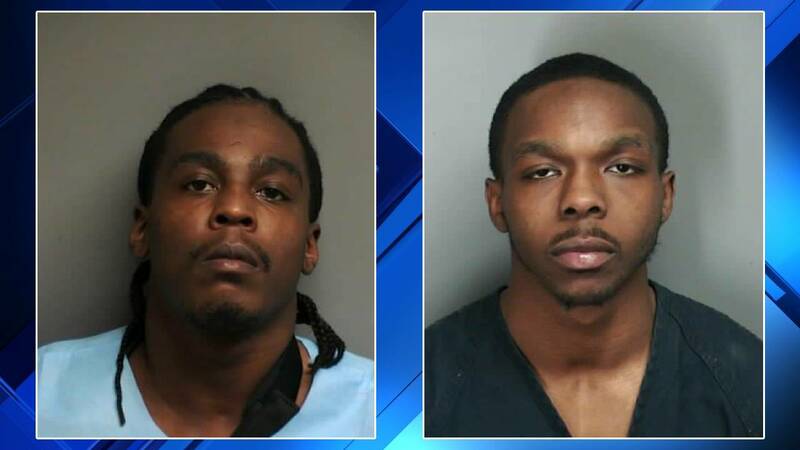 HARRISON TOWNSHIP, Mich. - Two men from Macomb County were arrested after police found them with handguns and items stolen during a string of car thefts, according to authorities. Devin Cannon, 27, of Shelby Township, and Kyle Rhodes, 22, of Clinton Township, were in the area of Cottrell Road and Jefferson Avenue in Harrison Township around 5:45 a.m. Thursdsay, police said. Officers were called to the area on reports of a suspicious person walking through yards and looking into vehicles with a flashlight, police said. The person got into a vehicle and left, according to neighbors. Deputies saw the vehicle as it pulled into a driveway. Cannon got out of the vehicle and went into the backyard of the residence, officials said. Rhodes was found lying down on the passenger seat of the vehicle, police said. The homeowner didn't know the men, according to police. Officers searched the vehicle and found a flashlight, gloves, two handguns, a rifle magazine, a wallet, pill bottles and credit cards that they said didn't belong to the men. There were several reports of people breaking into vehicles in the area, police said. The guns, wallet and prescription medications had been stolen from various vehicles over the last several hours, according to authorities. A Macomb County Sheriff's Office K-9 unit arrived and found Cannon several streets over, police said. He refused to obey deputies and resisted arrest, officials said. Both men were arrested and taken to the Macomb County Jail. Cannon is charged with two counts of receiving and concealing firearms, possession of a firearm by a felon, possession of ammunition by a felon, conspiracy to commit breaking and entering of a vehicle to steal property worth $1,000 to $20,000, stealing/retaining a financial transaction device without consent, two counts of possession of a controlled substance and assaulting/resisting/obstructing a police officer. Rhodes is charged with two counts of receiving and concealing firearms, possession of a firearm by a felon, possession of ammunition by a felon and conspiracy to commit breaking and entering of a vehicle to steal property worth $1,000 to $20,000. Cannon and Rhodes were arraigned Saturday in 41-B District Court of Clinton Township. They are each being held on $25,000 bail. Both men are scheduled to return to court Jan. 30 for a probable cause conference.